Description: Eve has a new home, a new face, and a new name—but no memories of her past. She’s been told that she's in a witness protection program. That she escaped a dangerous magic-wielding serial killer who still hunts her. The only thing she knows for sure is that there is something horrifying in her memories the people hiding her want to access—and there is nothing they won’t say—or do—to her to get her to remember. 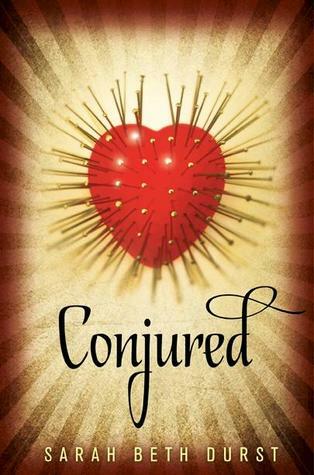 My Thoughts: CONJURED was breath-taking, amazing, compulsively compelling, and totally awesome. I run out of superlatives when I think about this story. The main character is Eve who begins the story in a new home, with a new face, and no memories of her past. She is told that she is a witness to a crime and under the protection of the US Marshall's service. Malcolm is one of the marshals who are protecting her and he is the one she can trust who helps orient her to the world around her. She is given a job as a library page and gets to meet Zach who is a wonderful character as well. He is constantly spouting trivia and totally honest and accepting. Zach is the one piece of her life that she can count on despite her horrifying visions and memory lapses. And together they can do amazing magic. We gradually learn that the Marshals are trying to track down a serial killer and that there are multiple worlds with all sorts of amazing beings. Earth just happens to be the one without magic which should make it a safe place for Eve. Eve's visions help the marshals track down the killer. Durst thanks her nightmares for her inspiration for this story. It is true that the story unfolds something like a nightmare with abrupt transitions and surreal events. But at heart for me this is the story of what it means to be real and what it costs too. I highly recommend this amazing story to all fans of fantasy. "How many times have we had this conversation? How many times have I forgotten everything I've done?" She waved her hand at all the photos on the bulletin board. "How many times have I forgotten everything I thought, felt, decided, believed? Everything I cared about? Everything I am?" I received this eARC from the author for review. You can buy your copy here. Okay don't know if my first comment went through! If it did just delete this one lol.